A successful & healthy marriage is all about sacrifice, putting your partner’s needs ahead of your own. Since getting married 3 years ago, my wife and I had to learn how to live with each other regardless of our differences. One thing that we had in common though was our mutual love for toys. Sure my toys were more on the robot-y violent side and hers were more...cute? 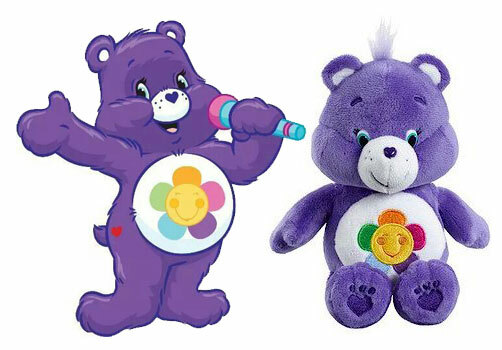 But one toy thing we did have in common was that we both liked Care Bears. Yes I like Care Bears. Unfortunately, it was this mutual love of those colorful bears that led to a major disagreement in our marriage. One that I would not back down on….you see, when it came to Care Bears...I AM GOOD LUCK BEAR. Now before we go any further, please allow me to clarify that statement...no I am not delusional into thinking I am a little green bear that can shoot beams out of my stomach (although that would be cool). And no this is not some case of perverted roleplay game that my wife and I are into. We just happened to have a the same favorite Care Bear and have both claimed ownership of said bear. Now rational minds would say what’s the problem? Can’t we both be Good Luck Bear? And to that...I have to respectfully say no...there can only be one Good Luck Bear in the family. 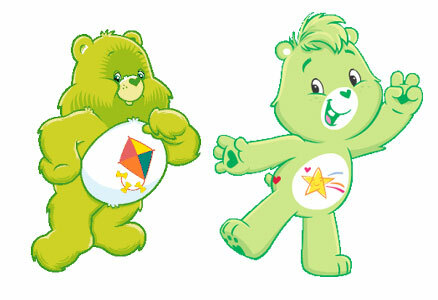 Ever since I saw their toy commercial way back in the 80’s I’ve always been a fan of the Care Bears. Back then, I was all in. I had a bunch of action figures, figurines and sticker books and would watch their cartoons and movies. Of the ten original bears, Good Luck bear was my instant favorite, basically because he wasn’t colored pink or yellow, or didn’t have any ‘girly’ symbol on his tummy like a flower or hearts….he was also the only green bear and his 4 leaf clover symbol was ‘manly’ enough for me. As for my wife, Good Luck Bear was the first stuffed toy Care Bear she got as a child so of course he had to be her favorite as well. 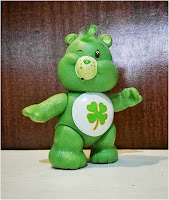 Personal histories aside, my ultimate reasoning on why I should be Good Luck Bear was sound….simple fact, Good Luck Bear was a GUY (another fun fact, despite the yellow color, Funshine Bear was apparently a guy too!) so obviously I had to be him. 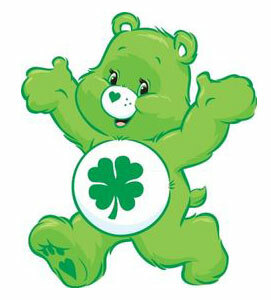 But that didn’t matter to my wife, she still insisted that SHE was Good Luck Bear. To be fair, he was at times voiced by a woman in some of the movies. 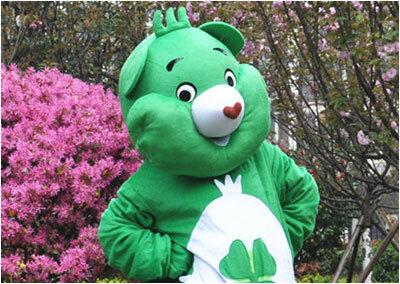 But if you look up the Care Bear wiki (yes they actually have one) his gender is listed as male. 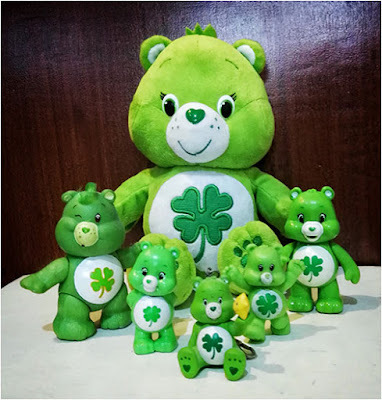 Anyway, while Good Luck Bear did start out as the only true green bear in the group, eventually a couple more green bears were added to the group, first was “Do-Your-Best” (to come up with a better name) Bear and then later on they gave us Oopsy Bear. 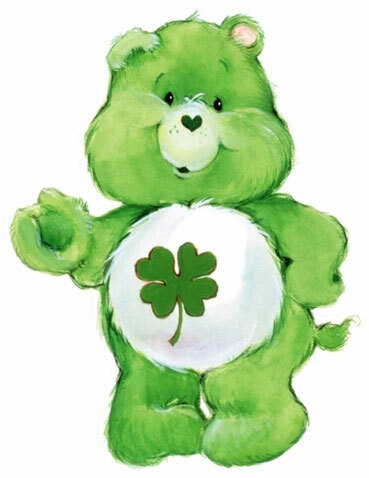 Funny story, in attempt to strengthen her claim on Good Luck, my wife downloaded some Care Bear desktop icons for her laptop, including a “Good Luck Bear” icon which she said was her...unfortunately, that green bear turned out to be ….Oopsy Bear...oops! Eventually, I finally wore my wife down and she ultimately conceded that I was Good Luck Bear. She instead took ownership of another Care Bear. Harmony Bear was actually the first Care Bear beanie toy we gave to our daughter and is admittedly her favorite of the bunch (yes when both parents are collectors, you WILL get more than just one Care Bear) We chose Harmony Bear first because she was colored purple which is my wife’s favorite color and since we are both fans of music. Our daughter’s name is Cecilia, after the patron saint of music. These reasons were enough for my wife to concede ownership of Good Luck Bear to me. So all is good again in our household as I am finally the uncontested Good Luck Bear of our family.